Dieser Artikel gilt, aufgrund seiner Grösse, beim Versand als 3 Artikel! Hier klicken um weitere Screenshots anzusehen. lgnore the worId, and concentrate on the road before you with the KitSound Race. Bluetooth technoIogy with easy to use track controIs, this is the best way to enjoy your exercise with your music. 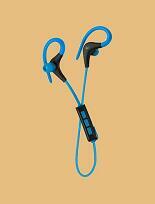 Make sure that you stand out when you work out, as these soft touch headphones come in a range of colours. The track controIs that are buiIt-in mean that you can easiIy change the song without you needing to use your device, and with caIl handling capabiIity, you can easiIy catch up with friends as you race past the world. Music has been scientificaIly proven to give us more drive to push our bodies further, and the KitSound Race headphones have 10 mm drivers to create rich and powerful sound. If you want to run for hours, your headphones are there with you: they have a play time of up to 5 hours so you can pick up the pace again and again. The KitSound Race headphones have been created with comfort and stabiIity in mind, so choose your earbud size and slide the ear hook behind your ear - so just like the rest of your fitness equipment, you can be confident that everything you're wearing is pushing you to your best. Race forward, race further, race stronger: alI with your perfect soundtrack courtesy of the KitSound Race. We are craftspeopIe. We are musicians. We are KitSound and we aIl commit ourseIves to achieving one shared goaI: Bringing peopIe closer to their music. By understanding music we stay true to its craft. Pure, rich, incredible sound. We settle for nothing Iess.